Is Vegetable Oil healthy? The scary truth! Cooking oil is something we use generously in our food. Right from deep frying to salad dressing we use oil to cook almost everything. Oil turns out to be a major ingredient that we consume everyday, in a rather large quantity. And most of us use Vegetable Oil for cooking. Why? Because we are told that it is healthy to use refined, vegetable oils. The rise of vegetable oils! So when you hear “vegetable oil” it sounds so healthy because after all “vegetables” are healthy right? Wrong! These oils didn’t exist or were not so popular until about 1960s and then there came a dramatic change. For instance take a look at the picture below that shows how people in the USA have literally started replacing healthy fats for the processed vegetable oils. The marketing goes like this – they have made you to believe that traditional cold pressed oils are unhealthy and that those oils contain high amounts of fat (leading to heart diseases and other complications). And so these companies promise you that they provide you with “light” versions of the oils. So you eat “heart-healthy” diets. Our ancestors didn’t consume these processed seed oils. And they didn’t have heart attacks at the age of 40 either. Cancer was not so common those days like it is today. And we have other major health issues that are dramatically becoming so common (like diabetes for instance). What is wrong with vegetable oils or seed oils (is vegetable oil healthy)? Let me discuss in detail. Well, we do need fats. I’m sure you do agree with me on that. And there are many kinds of fats. There are good fats and the bad ones. The good ones help in the development and function of your vital organs, like for instance the brain. Human brain is composed of 60% fat and you need fat to be sane and smart. You need the good kind of fat to have your brain in good working condition. At the same time, think how much your brain’s function and its health will be affected when you consume the wrong kind of fat? Let’s talk about fats because the knowledge about the type of fats and how changing their consumption quantity affects our body is highly crucial to understand all this! Unsaturated fats (includes monounsaturated and polyunsaturated fats) – These are good and we need them as part of healthy diet. These fats, if consumed in the right amounts, do not lead to fat deposition in your arteries or disturb your cholesterol. But we are told so! In fact polyunsaturated fats balance the cholesterol level in the blood. But if you consume it in large amounts, you disturb the balance. Saturated fats – These are the good kind as well and they help in proper brain function. Brain cells contains a lot of saturated fats. These fats also play a crucial role in hormonal balance, and in protecting the liver and immune system. Saturated fat becomes solidified at lower temperatures which is why they are mostly called solid fats. Coconut oil and palm oil are rich in saturated fats and that is why they are much stable (when heated). Trans fats – These are the bad guys because these are not common in nature. These are the most unnatural form of fats and are present in high quantities in the industrial oils. They are artificially hydrogenated and hence are dangerous. Trans fats are stuff that you need to avoid completely. Vegetable oils contain very high amounts of trans fats. Trans fats contribute to inflammation in the cells and are highly toxic. Hence they increase the risk of cancer, heart diseases, diabetes and obesity. By consuming vegetable oils in large quantities, we are disturbing the balance. Take a look at the dramatic rise in the consumption of trans fats (in the form of soybean oil) in USA. Our body cannot synthesize the saturated and unsaturated fats and they depend on external source – the food we consume – to get these fats. And when we do not provide them with what they need and instead provide them with lots of trans fats, our bodies don’t have an option but to use what is available! The balance is totally disturbed here. As a result, trans fats take the place of healthy fats in the body. This results in a number of health issues. Trans fats increase the level of triglycerides in your blood and hence cause cardiovascular problems. They also lower the level of High Density Lipoprotein (HDL) – which is the good kind of cholesterol – and increases the level of Low Density Lipoprotein (LDL) – which is the bad kind of cholesterol. Another balance that is disturbed is the omega 6 omega 3 fatty acid ratio. 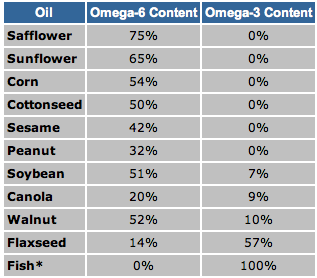 The healthy ratio of Omega 6:Omega 3 is 1:1 or 1:2. But the industrial seed oils simply collapse this ratio. Take a look at the picture below and you will understand what I mean. By consuming vegetable oils that are rich in omega 6, we are actually replacing omega 3 in the body with omega 6. We are making our brain to absorb omega 6 instead of omega 3 and this leads to a lot of complications. Dyslexia is caused by the lack of enough omega 3 in the brain. Vegetable oils contain high amount of polyunsaturated fats (PUFA) and these fats are quite unstable and oxidise easily. In the process (of breakdown), they release toxic materials that can cause inflammation and mutation in cells. This mutation leads to various health issues. Mutation in the cells in breast, skin etc. result in abnormal cell growth leading to cancer. Mutation that occurs in the reproductive system leads to health conditions like PCOS and Endometriosis that are associated with female infertility. Mutation occurring in the cardiovascular system results in clogged arteries. Such mutation also affects the rapidly dividing cells inside a pregnant woman’s womb. In short, it touches all levels and areas of life! So vegetable oils are natural, you think. How can they be unnatural if they are derived from vegetables? First of all, it was a smart move to make edible/cooking oils from seeds. Seeds are available in surplus quantities and usually will be wasted a lot if they are not used for making vegetable oil. The thing is – the way in which the oil is extracted from the seeds matter a lot. When the seeds are cold pressed, and when the oil is extracted from them, the oil that is extracted does not go through complicated process. And this is the traditional way of extracting oils. But the industrial method is totally different and involves the inclusion of harsh chemicals in the process. And it also involves heating the seeds to very high temperatures, which make the end product pretty toxic. Many free radicals are released in the process which are harmful. Take a look at the major steps involved in the extraction of vegetable oil from seeds and refining them. This makes me say “No Thanks!” to processed/refined vegetable oils right away. Due to this industrial process, as I said earlier, cooking oil is pretty toxic. I am not saying that you are buying a bottle of toxic material but it turns toxic when you use it for cooking. When heated for cooking, vegetable oils break down and release toxic substances called aldehydes that cause cancer and other diseases. This is one side of the story. Another side of “being unnatural” comes from the nature of the seeds themselves. The plants are treated with high quantities of pesticides. So when seeds come to the table for the manufacture of edible oils, they are already pretty toxic. And most of the seeds are genetically modified. 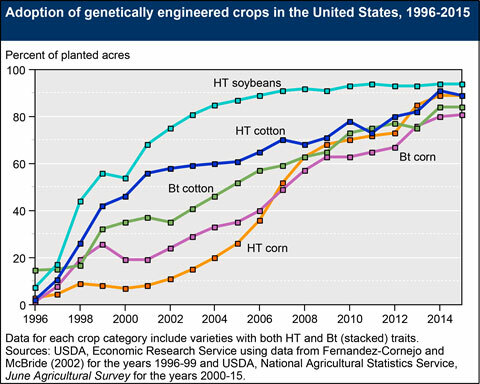 Take a look at the graph below that shows the adoption of genetically engineered crops in the US. If you notice the rise of diseases among the population, it should ring the bells. Diseases that used to be very rare are now quite common these days. Gone are the days when people lived by eating healthy food. Now we are eating lots of unhealthy stuff and consume medications to cope with the resulting diseases. The original, organic fat that our ancestors consumed were healthy by default. For instance, butter. It is a healthy form of fat and it is a heart healthy fat, in fact. But we are made to believe that they are unhealthy form of fats. And we were introduced to low fat diet. 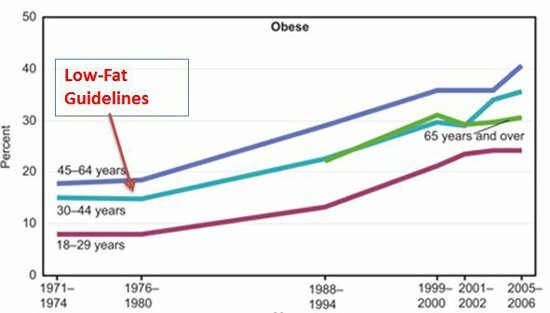 You can notice from the graph below (source) that obesity in USA started to increase just about the time of introduction of low fat diet. So what can you do about this? How can you save yourself, your family and your generations from this danger? You should opt for healthy oils. Get back to square one and start using what our grandparents and great-grandparents were using. You should not put yourself in danger by using the unnatural, vegetable oils for cooking. You do have healthy alternatives! You have to restore the healthy balance of saturated and unsaturated fats in your body. You can also get your supply of saturated and unsaturated fats from animal products as well (apart from cooking oils). For instance, fat from meat, dairy, eggs, nuts and seafood, are essential and when consumed in moderate quantities, they are extremely healthy. What (list of) vegetable oils should you absolutely avoid? Sunflower oil, Safflower oil, Canola (Rapeseed) oil, Corn oil, Soybean oil, Grapeseed oil – these oils are highly processed and are rich in trans fats – the kind of fats you should absolutely avoid! I just explained what’s wrong with vegetable oils. And I also provided you with healthy alternatives. All you have to do is change. 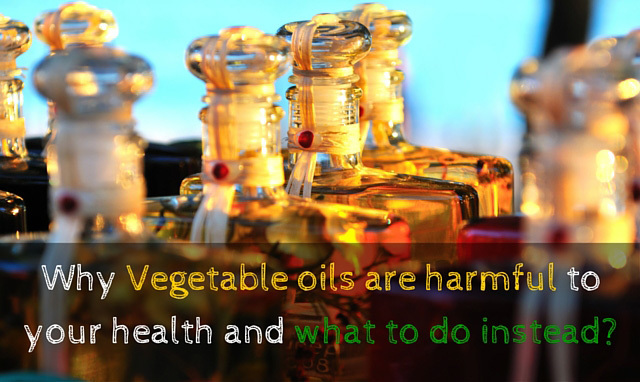 Opt for healthy alternatives to vegetable oils. 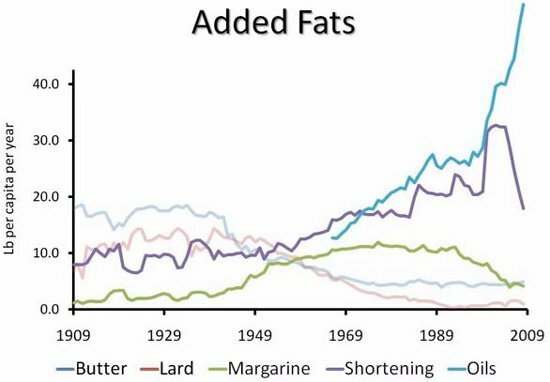 Vegetable oils became so popular because they are quite cheap. 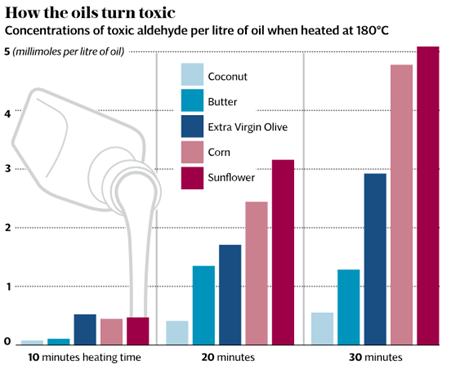 Compare the cost of a bottle of sunflower oil to a bottle of olive oil. But that doesn’t mean we should trade our health for money. The money we save by eating unhealthy, cheap food is usually spent in treating the diseases/health issues we get as byproducts. Vegetable oils are available for low cost because their production cost is low. Seeds are surplus and with the use of harsh chemicals, more quantity of oil is extracted from the seeds – unlike the traditional grinding and cold pressing. Diabetes, Cancer, Cardiovascular disease, Hormonal imbalance, Endometriosis and PCOS that are related to female infertility, Obesity and many more! Aren’t you convinced yet? Bring back the balance (of essential fats in your body) by opting for healthy alternatives to vegetable oils. Informative msg at the right time…. A good example how businesses can manipulate people. When the average man hears the world oil, he almost always associate it with healthy cooking. In most of the cases, it is just the opposite. And you have put together a good list of reasons why. Great article. That’s right. We are made to believe cooking oils are healthy. Thanks for stopping by. Hi Jane, I’ve found this(your) article on Google+. I’m +Menlify there, and although I’ve already commented and shared this article, I can’t resist commenting after reading the entire article. There are lots of information here and hopefully this could help the majority of people who believed that vegetable oils are healthy and saturated fats are the villain. Although we can’t blame those people who perceived vegetable oils as healthy, I think we bloggers have this role of sharing information to the public for the sake of raising awareness. We can also find many doctors including integrative medicine and functional medicine doctors who shared the same sentiments about vegetable oils. The evidence is clear, there are dangers in vegetable oils. Back in 2012 and previous years prior to that, I’ve been overweight and it was an uphill battle to lose weight as I was heavily using vegetable oils and low-fat diet. It was a horrible experience, and I can feel those who experience the same struggle I did in the past. Thank you for sharing your insights in this article plus the many sources you cited are helpful for further research. And, it’s good you’ve mentioned the GMO because one of the most touted best oils today is corn oil, but in fact, it is a double hitter… first vegetable oil is bad and unstable, and most corns are genetically modified. You are doing a very good work by making people aware about the importance of consuming healthy things.Our health status is mostly depends on what we consume. if we consume good and nutritious things ,we remain healthy or vice versa. Thank you for such a detailed and understandable explanation on this issue. The question of nutrition is extremely important to me and it was useful to understand it in more detail. Didn’t know much about oils.